World War I Bridges - WW1 Centenary from the river Piave: Interview with André Loez, author of "14-18. Les refus de la guerre. Une histoire des mutins"
Interview with André Loez, author of "14-18. Les refus de la guerre. 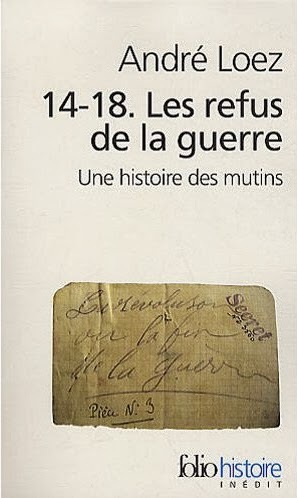 Une histoire des mutins"
Today we're delighted to offer to our readers a very special interview with André Loez, the French historian author of the book entitled 14-18. Les refus de la guerre. Une histoire des mutins (folio histoire inédit, Gallimard, 2010). After the previous post about the importance of smell during the Great War, both from real and metaphorical/polical sides, once again we try here to stay accross-the-board. Many times today we hear about a kind of "nationalism" rising from the words of politicians when they make speeches on the eve of this crucial Centenary. The risk is just around the corner and everybody knows this. We strongly believe that these across-the-board themes are the ones to chase in doing such editorial projects, also because they are by far more interesting than any other theme ascribable to a kind of veiled nationalism. One of these themes is the one connected with dissent and mutinies, something that all the belligerent armies and populations had in common. We want to thank again André Loez for his answers. WWIB: Spring 1917. Can you shortly explain the crucial meaning of this date? Are the deep crisis in the French army and the emergence of a vast dissent among the soldiers to be connected to single historical events and defeats? Or is it a consequence of a long-period change in the social and symbolic understanding of the WWI also in the civil society? A.L. :There are both long-term and short term trends that can help explain the mutinies. On the long term, the growing disillusionment with the war is perceptible as early as late 1914 or the beginning of 1915, especially among the French infantry, confronted with heavy losses. But this discontent is difficult to voice and does not lead to widespread, overt acts of refusal before Spring 1917, where several events add to one another and create a more favorable context for dissent: news of the First Russian revolution, and of the US entry into the war give soldiers an impression of instability. Of high importance is the military failure on the Chemin des Dames after the April 16 offensive: many French soldiers had hoped for a final battle leading to victory, and are angry at the high casualties while losing hope of any foreseeable end to the war. And in the aftermath of the offensive, strikes in the rear as well as political turmoil (some members of Parliament talk of sending the commander-in-Chief, Nivelle, to court-martial!) helps create a path towards collective action. WWIB: We guess that the "mutiny" was a nuanced and patchy phenomenon. Which are the most common forms of mutiny in France? Which are its main protagonists? Can you provide a social, psychological and cultural map of it? A.L. : Mutinies were highly diverse in the French army, and included violent demonstrations, collective desertions, and peaceful protests. It was almost impossible to refuse fighting in the front lines, as it would expose oneself and fellow soldiers to increased danger. Soldiers therefore mutinied in the immediate rear, in the villages behind the front, when they were ordered back to the trenches. Many simply refused to go and fled or hid in the countryside, others marched in protest, shouting “Down with the war!” and singing the International; some committed acts of violence towards their officers or simply took the chance for violent behavior as a release from prior discontents and tensions (drinking, breaking material, especially in train stations). Among the mutineers, some men, generally with a slightly higher education or a prior militant background, tried to shape events and to organize protest: in one regiment, such soldiers drafted a petition for peace that was signed by over a thousand of their comrades. In this case, as often, officers were not threatened, and mutineers treated them with respect, asking them to convey their many grievances to the government: rest, leave, peace, equality of hardship and sacrifices in the country and the army. WWIB: Did you have the chance to compare the French case to other European (or American) cases? A.L. : Indeed, 1917 was a tumultuous year for most armies: in Russia of course with revolutionary events and soldiers’ committees; these were also found in the German Navy in July 1917 and again in October-November 1918 leading to the Revolution. In Italy, infantry brigades (Ravenna, Catanzaro) mutinied in Spring and Summer 1917. The Russian expeditionary force in France also refused to go on fighting, leading to violent confrontation with the French army in September 1917. And in Austria-Hungary, along with massive desertions, naval mutinies also took place in early 1918 (at the naval base in Cattaro). In this context, the French mutinies reflected a common yearning for peace; they were also more massive than in some other armies, implicating (at least) around 50.000 men. Yet they did not lead to revolution, as in Russia and Germany, for two main reasons: such a course would have led to defeat, still unthinkable for French soldiers, and their movement had no support in the rear (in the form of strikes, demonstrations, organized political alternatives) whereas German and Russian military dissenters eventually were linked to wider groups and parties (the USPD, the Bolsheviks) that helped transform mutiny into revolution. WWIB: Interpreting the historical sources is always a difficult and delicate task: one runs the risk to ascribe a unified meaning to personal and dissimilar convictions and behaviors. Can you describe how and in which extent the single episodes of mutiny were part of a collective feeling of revolt? A.L. :This has been an interpretive problem for the mutinies: many scholars have studied them and selected, in the myriad documents and quotations from the mutineers, a few phrases that they used to sum up the movement: for some, it simply was a limited military protest (G. Pedroncini), for others, a kind of strike (D. Rolland), or a negotiation of authority by citizen soldiers (L. Smith). What I try to show in my work is that all these interpretations can have some truth but that historians must pay attention to the full spectrum of protest. French citizens were diverse in their backgrounds and opinions before the war, and the mutinies reflect this diversity: different individuals gave different meanings to a common event of revolt, some hoping for a revolution or an end to the war, others wanting rest and better treatment for the army, and others still expressing in a violent way their frustrations. WWIB: Turning from the national to the international context, was the revolt movement in France connected to an international network of dissent against the Great War? If yes: to which extent? Which communication strategies were used? A.L. :There was no network, and even within France mutineers were isolated from pacifists in the rear. The only form of coordination that could have existed was the projected socialist pacifist conference that was scheduled (and several times delayed) in Stockholm in the Spring of 1917. Many French soldiers learned of this event and hoped it would end the war. When a French officer arrested a mutineer on a road, away from his unit, he asked him where he was going: “To Stockholm” was his answer. A major consequence of the mutinies was the refusal of the French government to grant passports for Stockholm to French delegates, on the new commander in chief’s insistence (Pétain), effectively canceling the reunion. WWIB: We know that words are an impressive propaganda media. How were the soldiers who expressed rebellious or pacifist attitude perceived both by the army and the civil society? Which words were used - maybe even coined - to describe them? A.L. : In the army, a major theme was the alleged drunkenness of the mutineers, among whom officers tried to look for “ringleaders”. Many were convinced that the movement had to be organized from the outside, much as, in Italy, general Cadorna blamed pacifists and socialists for indiscipline and desertion in the army. But the civil society did not have any representation of mutineers as these events were silenced and censored, and only discussed (timidly) in the years after the war. WWIB: In Italian we can read the detailed and fascinating study by Antonio Gibelli L'officina della guerra, a book dedicated to similar themes. Any reading suggestion beside your book 14-18. Les refus de la guerre: Une histoire des mutins? We mean also novels or other essays published in other countries. A.L. 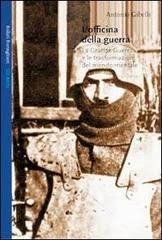 : A major work on the German army during the war is that of Benjamin Ziemann, War experiences in rural Germany, 1914-1923 (Oxford, 2007), looking at ordinary Bavarian peasant soldiers’ reluctant attitudes toward the war. In France, a recent path-breaking study by Nicolas Mariot (Tous unis dans la tranchée? 1914-1918, les intellectuels rencontrent le peuple, Paris, 2013) shows the extent of the estrangement between bourgeois intellectuals in the army, and their working-class comrades. On the literary side, there has been a huge French production in recent years, culminating with this year’s Prix Goncourt (the most prestigious literary prize) by Pierre Lemaître, Au revoir là-haut, set in the immediate wake of the war.